So our baby Leo is officially the guinea pig for testing new recipes in our household. He’s basically my full-time blogging assistant. When I’m in the kitchen testing new recipes, he drags himself all over the kitchen floor (that’s his attempt to crawl) and plays with my toes while I do my food prep. It’s like a free foot massage. What kind of blogging assistant gives you a FREE foot massage?! It’s a pretty sweet deal. Then, he bounces around to his music in his jolly jumper while I take my recipe pictures. He’s like my own personal cheerleading squad. And best of all, he tries all of my new concoctions, with a great deal of enthusiasm, I might add. Whenever I put him in his Fisher Price high chair booster seat (which is highly recommended, by the way), he starts flapping his arms around doing a little happy dance and gets this massive grin on his face. I think he’s starting to connect the dots that when he sits in his little chair, he gets to try out one of mommy’s new recipes. I’m actually really flattered that he gets so excited about the food that I give him. Wouldn’t it be nice if everyone flapped their arms around and gave you a super cute grin when you set food on the table?! It just makes you feel so appreciated. The other day, we went grocery shopping and bought a butternut squash on a whim. I really had no idea what I was going to do with the thing, but it seemed like a good idea at the time. When we got home, Leo and I started brainstorming recipe ideas together. Tasty, but we’d already been there, done that. We wanted to try something new. And then, suddenly it dawned on me. 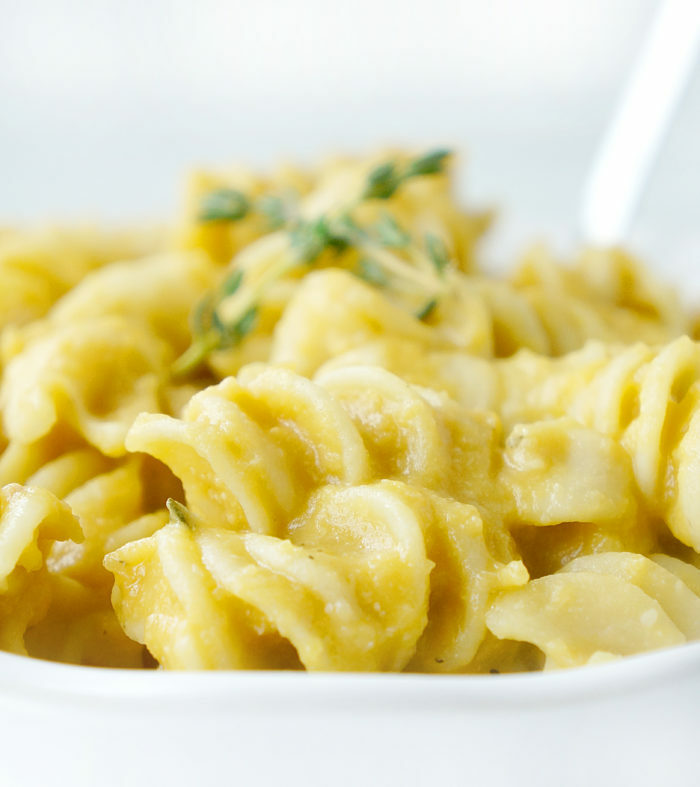 What about doing a healthier butternut squash mac and cheese?? 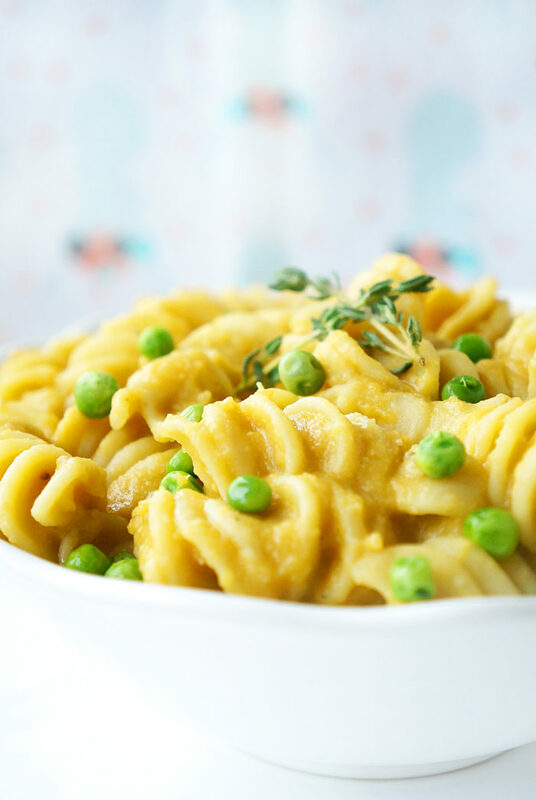 I hadn’t given Leo pasta yet, but I thought he might enjoy the texture, especially when paired with a creamy butternut squash sauce. My husband also LOVES pasta, so I knew he’d be eager to try out this new recipe experiment as well. 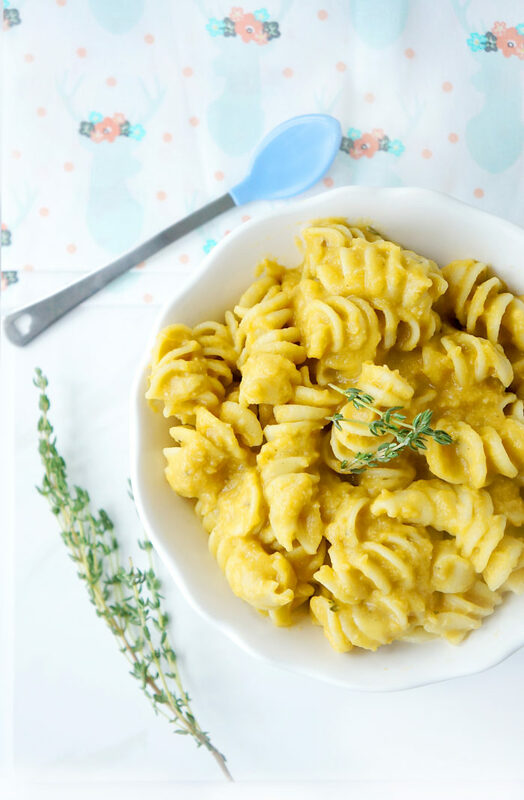 We had a busy day ahead of us, so I decided to put all of the mac and cheese sauce ingredients in the slow cooker to cook throughout the day while we ran around doing some errands. Along with the butternut squash, I also decided to throw in some red split lentils, since I’m pretty much obsessed with lentils these days. The good news is, by the time we got home, the butternut squash was nice and tender so all we had to do was puree it using an immersion blender to make it smooth and creamy. Next, I just threw in some milk, cheddar cheese and seasoned it to taste and served it along with these Lentil Veggie Muffins (which is basically like a super delicious vegetarian “meatloaf”) for the ultimate meatless meal consisting of nutrient-jacked comfort food. I was very super pumped about this dinner. It turns out that we all thoroughly enjoyed the mac and cheese and Leo downed it like a champ. It was nice and creamy, had a slightly sweeter taste to it from the squash which was a welcome addition, and was nice and filling due to the fibre and protein content (9 grams of fibre and 13 grams of protein per serving to be exact)! How often can you find mac and cheese with THAT much fibre and protein?? You can also feel free to add in extra veggies like peas, broccoli or spinach to switch up the flavour profile and add in even more nutrients and colour! 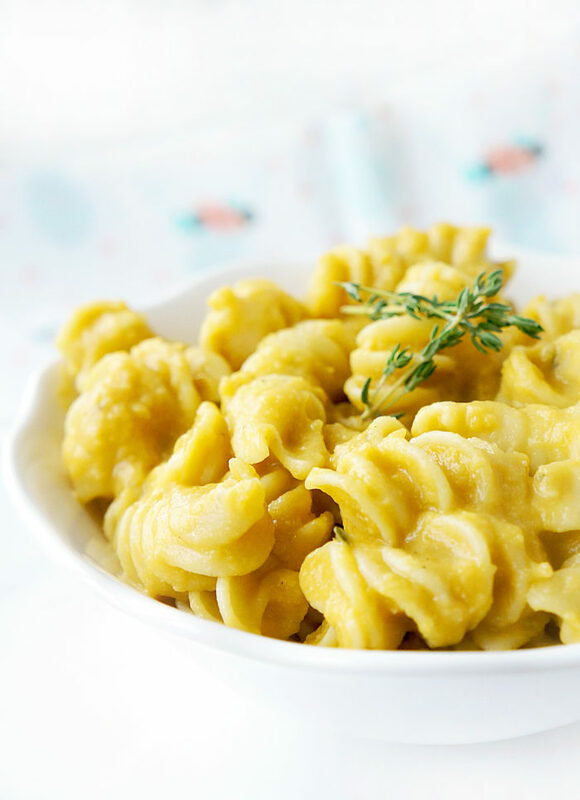 No matter how you serve it, this mac and cheese is delish! In a medium skillet, heat olive oil over medium heat. Stir in onion and garlic and cook until browned and fragrant, about 3 minutes. Add thyme and cook 2-3 minutes. Pour into warmed crockpot along with the bay leaves, 2 cups of broth plus the squash and dry lentils. Stir, cover and cook in crockpot for 3-4 hours on high or until squash is very tender. Once the squash is cooked, remove bay leaves from mixture. Using an immersion blender, liquify the squash to create a smooth sauce (you can place in a regular blender if you don't own an immersion blender). Stir in milk and cheddar cheese. Taste and adjust seasoning to your liking. Sauce should be slightly sweet because of the squash. Toss with cooked pasta and serve with extra cheese, add in optional veggies or top with a pinch of red pepper flakes or hot sauce, if desired. * If serving to babies, it's recommended that you leave out the additional salt. However, for adults and older children, you may wish to add some salt for extra flavour. **If making sauce for baby and rest of family, scoop out one cup of sauce for baby and add some extra seasoning to remaining portion of sauce. 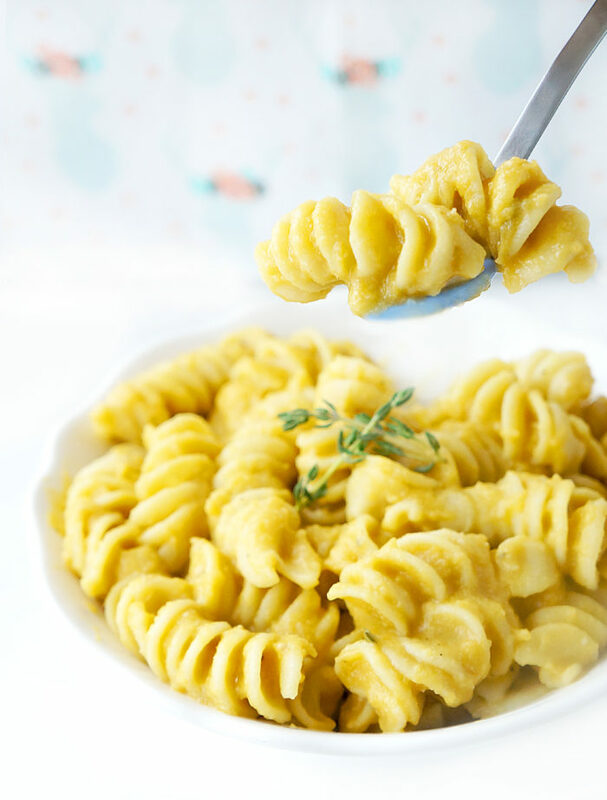 You can freeze baby's sauce in an ice cube tray and pop out a sauce cube whenever you would like to mix the sauce with some pasta for a quick and easy meal.